Fact mining to identify events and correlated entities. Emotions to detect emotional content related to entities within the text. Writeprint to assess authorship identification and stylometric characterization of text. Domain entities, temporal analysis and time references (alpha version), and extraction of relationships between them. Semantic Reasoning allows inferencing information not present within the text. Normalization and identity matching features enhance identification of people named in text. Cogito Intelligence API 9.0.0 out now! Just a few weeks left for the next CI API release! Working out the next fully featured taxonomy. Working on a brand new knowledge base. Stay tuned! GO TO OUR LIVE DEMO! 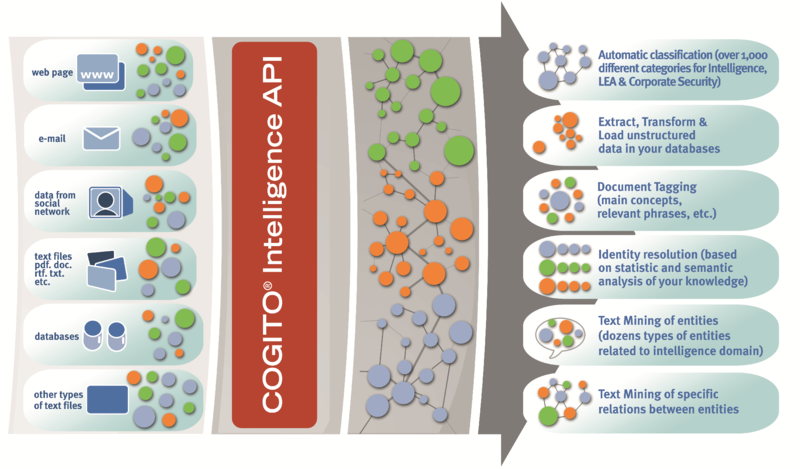 Cogito Intelligence API brings the power of semantic processing to your application or analysis pipeline, analyzing documents, web pages, tweets and any large data sets to enable Government, Intelligence, Law Enforcement Agencies (LEA) and Corporate Security customers to access and exploit some of their most strategic sources of information. Through a deep understanding of meaning and context in the processing of data, Cogito distinguishes between the high volume and various streams of intelligence information, resolving ambiguities more effectively than keyword or statistics based solutions. Assess authorship identification, stylometric characterization, writers’ intentions, text sources and formats. Free proof of concept testing. Free proof of concept testing available. What is Cogito Intelligence API? Cogito Intelligence API is a state-of-the-art semantic software that has unique and advanced capabilities to extract intelligence from data. Cogito Intelligence API brings the power of semantic processing to enable Government, Intelligence, LEA and Corporate Security clients to access and exploit some of their most strategic sources of information. Can I try Cogito Intelligence API for free? Of course. Interested organizations may try the Cogito Intelligence API Live Demo immediately. Both SOAP XML-based and RESTful compliant JSON-based web services are available for creating your proof of concept based on Cogito Intelligence API. Please, GET A KEY to develop your customized client application. What should I expect, in terms of response format, for Cogito Intelligence API analysis? The response format of Cogito Intelligence API semantic analysis service differs depending on the web service version you decide to use. For the SOAP version, the standard response format provided is XML, while for the REST version a JSON standard formatted response is provided. You can find hereinafter full featured response examples of both versions, based on a sample text: XML - JSON. What sets Cogito Intelligence API apart from its competitors? Cogito Intelligence API is the only semantic-based system with a knowledge domain dedicated to crime and intelligence including specialized classification for Intelligence, LEA and Geography, Entity and Relationships Extraction, Name Recognition and much more, allowing our clients to keep a step beyond competitors. Cogito Intelligence API is backed by over a decade of intelligence sector experience and combines best-of-breed analytics software in a scalable platform, bringing efficiency and speed to the process of acquiring, managing and sharing information. Click for details of our semantic features. What does Cogito Intelligence API offer me? - Easily integrate semantic capabilities into your analysis platforms or product to enhance their performance, either with a SOAP–based or RESTful solution. Will I be able to integrate Cogito Intelligence API into my already existing programs? Yes. Cogito Intelligence API customers will be able to easily integrate the API code with their current technologies and analysis platforms to enhance their performance. Specific plug-ins are already available for optimal integration with the most frequently used products on the market. What languages does Cogito Intelligence API support? At the present moment, the version available on www.intelligenceapi.com can support only documents in English. The Cogito Engine is capable of supporting the most diffused languages spoken globally and can be integrated with other technologies to increase the coverage to other languages. Does Cogito Intelligence API support incomplete and fragmented text? Yes. Colloquial or conversational excerpts, as well as fragmented text, can be analyzed with good results. However, grammatically correctness and context soundness sensibly improve the semantic engine performance, which works using linguistic and semantic algorithms. Terms are often ambiguous in meaning, and therefore the high sensitivity of our semantic engine ensures best performances on grammatically correct text and coherent context. This live demo is conceived for analyzing grammatically correct text, in order to provide you the best results. Which character encoding set is supported? The supported character encoding for this live demo is UTF-8. Usage limits are related to the type of service acquired, see our Freemium license model for further details. For extended usage limits, our "on-premises" version provides customized services in order to meet our customers' needs. The Cogito Intelligence API live demo version can process text files up to 10KB. Please contact us for more information on how to get started for free. Yes. We offer a Service Level Agreement for select service tiers. Please inquire for more information on Cogito Intelligence API commercial products and support options. Always. Various forms of support services are available for paid service tiers and system integrators. Please inquire for more information on Cogito Intelligence API commercial products and support options. How much text is required to generate results? Cogito Intelligence API works best with a minimum of 100 characters in order to generate viable results. The maximum generated results depend on the type of service clients choose. Our Cogito Intelligence API live demo can process up to 10KB of data. Please get in touch with our sales department for possible customizations of the “on-premises” distribution of Cogito Intelligence API. How fast are results generated? The full disambiguation performance of Cogito Intelligence API is dependent on the customers' local environment configuration for the "on-premises" distribution. Performance is fully scalable and able to tackle Big Data analysis. Does Cogito Intelligence API support non-text content? Our team is always available to answer your questions. Please see our contact page for national and international contacts. May 17th, 2018: Cogito Intelligence API 9.9.5 released along with the state-of-the-art features! Mar 5th, 2018: With the upcoming feature you'll be able to tune in the cut of the API's categorization. Stay tuned! Jan 25th, 2018: Cogito Intelligence API 9.9.0 released! Nov 11th, 2017: Working on a new integrated feature. Sep 11th, 2017: Cogito Intelligence API 9.6.0 released! May 25th, 2017: Cogito Intelligence API is released with the latest knowledge base update available! Apr 10th, 2017: Cogito Intelligence API 9.0.0 out now! Mar 22th, 2017: Just a few weeks left for the next CI API release! Feb 16th, 2017: Working out the next fully featured taxonomy. Jan 24th, 2017: Working on a brand new knowledge base. Stay tuned! Nov 1st, 2016: Cogito Intelligence API 8.7.0 released! Sep 12th, 2016: Cogito Intelligence API 8.3.0 released! Aug 16th, 2016: Working out a cutting-edge parameter to let you actively tune up the analysis process. Don't miss it! Jun 10th, 2016: Expanding the Text Mining algorithm for an advanced domain entities detection, recognition and extraction. May 23th, 2016: Packing up the next knowledge base update v.9.05. Mar 23th, 2016: Developing a new Emotions Taxonomy algorithm. Feb 15th, 2016: Cogito Intelligence API 7.7.2 is out! Jan 25th, 2016: Working on CI API's next knowledge base update. Stay tuned! Dec 10th, 2015: Refining the latest developments on a cutting-edge CyberCrime Taxonomy. Updates coming soon! Nov 19th, 2015: Working on a cutting-edge data mining solution in alpha version to provide temporal analysis of written text. Oct 12th, 2015: Cogito Intelligence API 7.6.1 is released! Sep 30th, 2015: With our enhanced tagging capabilities, core text elements easily pop up giving an immediate insight of the documents key information. Sep 11th, 2015: With more than 3000 new concepts, our latest knowledge base is even more rock solid and wide spread. Aug 20th, 2015: Developing a new Geo Fact Mining architecture to provide geographically referred facts and detailed geographical data. May 17th, 2015: Making CIAPI's new 15.07 knowledge base up, stay tuned! Mar 23rd, 2015: Cogito Intelligence API introduces the new Writeprint feature, for stylometric characterization of text! Aug 21st, 2014: Taking over Semantic Analysis with Emotions mining. More news to come in September! Jun 25th, 2014: Working on a brand new set of ontologies. Stay tuned! May 16th, 2014: Social Tags normalization and mining is online! Dec 12th, 2013: Cogito Intelligence API RESTful JSON-based is now ready, get a key! Our team is always available to answer your questions. Please see below for national and international contacts.